The in-escrow owner of the Wilshire Tower (Desmond's Building) at 5500 Wilshire is desperately trying to find anyone willing to support him in his quest to justify removing the historic neon crown from the Historic Cultural Monument tower. Nevermind that the signs are meritorious and technically a part of the HCM protection, the new owner wishes to trash the signs anyway. Although the quartet of neon signs at the top of this building are historically and culturally important not just to the neighborhood, but to the Miracle Mile district, the new owner wishes to remove the signs for the sake of the building's Art Deco purity and to recognize the architect's assumed, sign-less intent. His causes are noble to the goal of architectural preservation until he mentions that he will then mount his own quartet of giant neon signs in their place, all proclaiming the name of his own company. 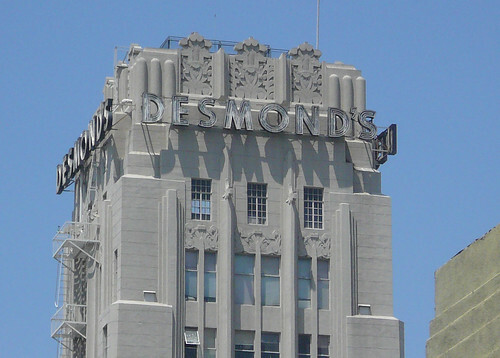 We Angelinos may call this building the Desmond's Building, but its proper name is the Wilshire Tower. The new owner stated that he wishes to remove all mention of the defunct haberdasher from the structure's colloquial moniker and restore the title of Wilshire Tower to the building. Again, it's a noble cause, but how will he accomplish this retitling of the building back to Wilshire Tower? The answer: By announcing the name of his company, Ace Gallery, from the top of the tower in four giant neon signs (in lettering taller than the existing, historic signage), by mounting more Ace Gallery neon signs on the east and west corners of the building, and by hanging fabric Ace Gallery banners six times across the facade. Considering that the banners are double sided, he's supposedly going to restore the Wilshire Tower's proper name by plastering the name of his own company 18 times across the building? Six times in neon? Huh? Is it me or is this guy desperate to make up any faux-historic plea just to get his company's name on the building? – 18 times on the building.